Once the Nazis came to power they introduced legislation intended to deny Jews freedom and restrict their rights. 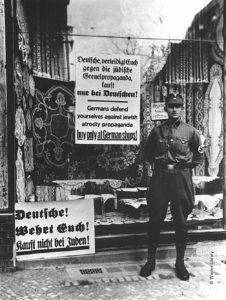 Boycotts of Jewish doctors, lawyers and shops began in 1933 and by 1935 Jews were not allowed to join the civil service or the army. The introduction of the Nuremberg Laws in September 1935 further increased Jewish marginalisation. Jews were banned from marrying non-Jews and their citizenship was removed, including their right to vote. As time progressed, more restrictions were brought in – Jews were barred from all professional occupations and Jewish children were prohibited from attending state schools. In 1938, further laws decreed that men must take the middle name ‘Israel’ and women ‘Sarah’. All German Jews would have their passports marked with a ‘J’. On 9 November 1938 the Nazis initiated pogroms (organised attacks on a particular group) against the Jews in all Nazi territories. It was a night of vandalism, violence and persecution that many have since described as ‘the beginning of the Holocaust’. 91 Jews were murdered, 30,000 were arrested and sent to concentration camps and 267 synagogues were destroyed. This night became known as Kristallnacht – the ‘Night of Broken Glass’ – so called because of the smashed glass which covered the streets from the shops which were looted.